Many people who live in Lexington, Kentucky do not realize that winter snow and ice can damage their HVAC systems. Further, this damage can bring harm not only to AC units, but to furnaces as well. So, how do I prevent snow from damaging my HVAC system this winter? HVAC maintenance prevents snow damage. When there are intense periods of heavy snow or ice these winter elements can quickly accumulate and block your exhaust pipes. This is potentially a huge hazard for your home. Carbon Monoxide is regularly produced through combustion in your furnace in order to create heat for your house. This process allows for safe venting of this poisonous gas through your exhaust pipes. However, snow and ice can accumulate and block these exhaust pipes. Therefore, carbon monoxide cannot be safely vented and can build up in your home. This could also cause damage to your furnace. Every home should be equipped with carbon monoxide detectors on every floor. The best way to prevent snow and ice from blocking your exhaust pipes is to check around the exhaust penetration in your roof to make sure that it is clear. It is especially crucial to check during heavier periods of snow and ice. If you do see that a pipe is blocked, you should safely climb onto your roof and clear the snow and ice. Better yet, call a professional HVAC technician to inspect your system and do the work for you. Climate Control in Lexington is a NATE-certified HVAC company that put the safety of their customers first. 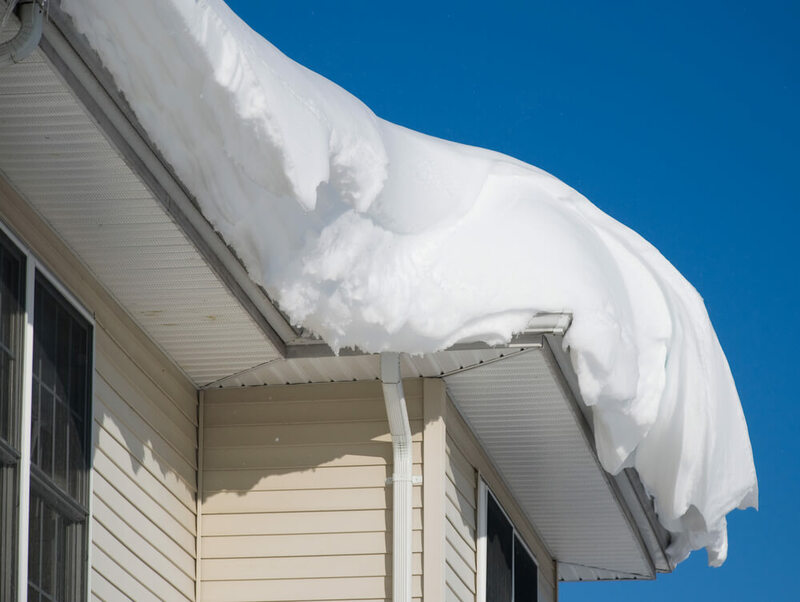 During the winter, water and snow can accumulate in your gutters. This leads to icicles forming, which can eventually lead to huge and heavy icicles forming. Since AC units are generally installed outside of your home, these heavy icicles can easily fall on and bust your system. Therefore in order to prevent this, during the winter you should regularly check your gutters above your AC unit for icicles and accumulating snow or water. You should also clear away small icicles as they form in order to prevent larger ones from forming. If your AC unit is damaged from icicles or snow, companies such as Climate Control offer great repair services for these units, furnaces, and more. Lastly when snow melts it can damage your HVAC system. This is because when snow falls and melts, there is a lot of water runoff. This water can form standing puddles on outside AC units and even cause flooding where your furnace is located. This can rust and corrode your units. In order to prevent these disasters, you should always clear your AC unit of large snow accumulation and also monitor your house for flooding when snow is melting outside. It is so important to prevent snow and ice from entering your HVAC systems. By taking the three precautions above, you can more effectively prevent damages and disasters from the ice and snow. However, if you find out that your heating and cooling systems are damaged due to snow and ice, companies such as Climate Control are available to help you. Certified technicians are trained to pinpoint problems with your system and provide quality repairs. If you are interested in hiring a Climate Control employee to fix your Lexington HVAC system, feel free to checkout our website or contact us directly at 859-469-4182. Don’t wait to fix your snow and ice HVAC unit problems! Purchasing New Home with old Furnace – What HVAC Questions Do I Ask?